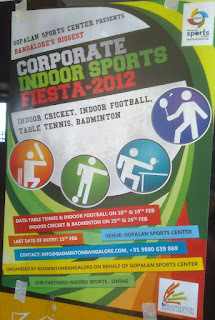 A friend of mine and myself participated in "Corporate Indoor Sports Fiesta - 2012 on 25th Feb 2012. It was Organized by Badminton Bangalore at Gopalan Sports Center, Whitefield. 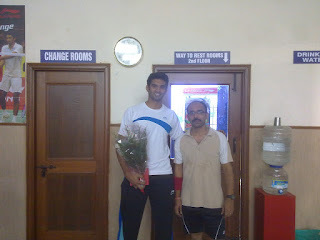 Anup Sridhar was the Chief Guest. Got to meet some fellow players from corporate area. I participated in doubles. 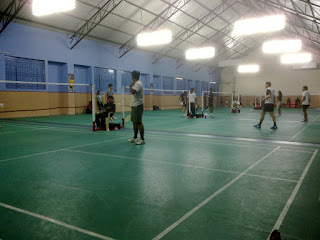 We lost even though we won the first game. I think my partner (Venu Sai) and myself rushed a bit in the second and third game which resulted in us loosing the match. Pulav served during lunch break was extra spicy :). Overall it was fun. Roof is a bit low and the shuttle flies a bit fast in this arena. Was good to play on the green mat.